Eggcited to let you know ecoegg will be joining forces with Addis this Easter bank holiday!! We have organised an egg-straordinary joint competition where you could be in with a chance to win a bundle of Addis & ecoegg products!! Keep an eye on the ecoegg & Addis twitter pages over the bank holiday weekend for details on how to enter this egg-celent competition – you won’t want to miss out! Have an egg-ceedingly good Easter! In April, we were thrilled to have been recognised with the UK’s highest business accolade, the Queen’s Award for Enterprise for outstanding business success in innovation. Since this significant high for the business, we suffered a very severe low. In June we were devastated to find we had been victims of a severe fire in our premises in Maidstone, Kent. The fire wiped out our stock and rendered our offices and warehouse uninhabitable. Since then, we have worked hard to ensure we got back to business as usual. After plenty of hard work, we are now firmly back in business, in larger premises in Gillingham. 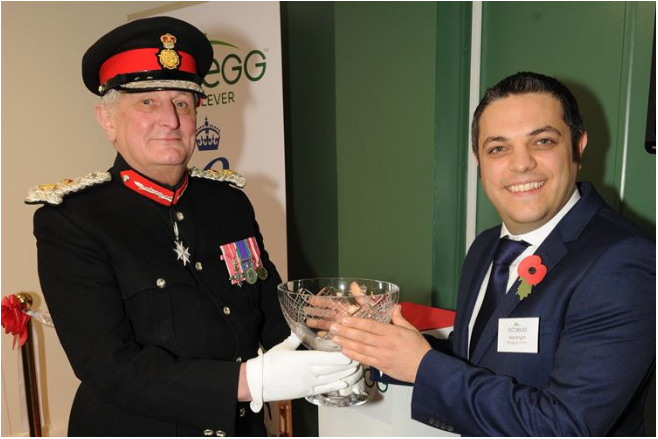 Last Wednesday, we were honoured to be visited by HM The Queen’s representative in Kent, the Lord Lieutenant, Viscount De L’isle, Member of the Order of the British Empire who officially bestowed the Queen’s Award and was also pleased to cut the ribbon, officially opening ecoegg’s new premises! 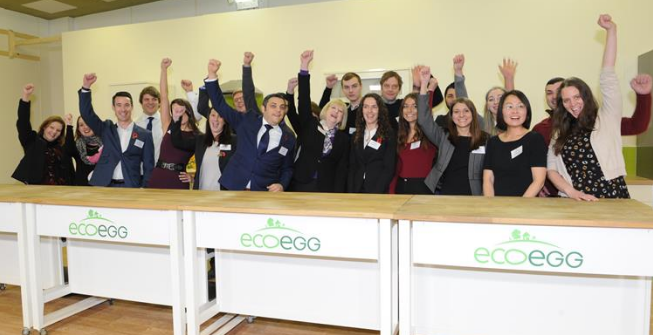 The event was attended by ecoegg’s friends, family, customers, suppliers, partners & supporters and was made even more special after successfully overcoming the challenges the business had to face in the last months. If you are interested in reading more about the day, take a look on the Kent Online who featured the events. Thanks for all your support over the years – we couldn’t have done it without you! Fancy WINNING yourself an ecoegg Stain Remover, Laundry Egg and our super adsorbent, Reusable Bamboo Towels this Halloween?? You can enter our competition via our facebook page (www.facebook.com/ecoegg). All you have to do is comment on the pumpkin competition facebook post with a photo of your pumpkin creation, like our facebook page & share our post, and you will be in with a CHANCE TO WIN!! The winner will be selected on Tuesday – so GOOD LUCK and HAPPY CARVING!! We are delighted that Robert Dyas have been added to our ever-growing list of stockists! You can now buy our Laundry Eggs, Dryer Eggs, Detox Tablets, Stain Remover and Fabric Conditioner online and in store at Robert Dyas. Not only this, but for a LIMITED TIME ONLY Robert Dyas are offering a HUGE 25% OFF ecoegg products! Be sure to take advantage of this offer while you can – it is only available this month! If you don’t have a Robert Dyas near you, don’t worry, you can order on their website too. Just £7.49 at Robert Dyas (for a limited time only). This works out at just over 3p per wash! Now just £7.49 at Robert Dyas! To take advantage of Robert Dyas’ great offer have a look on their website today. On the 21st April we were delighted and humbled to have Her Majesty The Queen announce we won a Queen’s Award for Enterprise in Innovation. Almost four months on from receiving this brilliant news, our Managing Director Rob Knight, has had the privilege of meeting The Queen herself! At the end of last month, the official Queen’s Award Reception took place which was a brilliant celebration of the award winners. I am told the day involved wonderful champagne, very opulent state rooms, and of course, a meeting with The Queen! We are striving to keep bringing you innovative household helpers, and we hope that you and The Queen will love the products we will be unveiling in the next few months – watch this space. Thanks for all your support – we couldn’t have done it without you! As some of you will know, we sell our products all over the world through shopping TV channels such as QVC. Last month was Rachael’s (our TV Product Demonstrator) first appearance on TVSN, an Australian shopping TV channel. “Last month I had my first visit to TVSN. This also meant my first ever visit to Sydney, Australia which I was very excited about! The schedule was destined to be grueling with 5am alarm clocks and late night returns to the hotel. Nevertheless, I was determined to steal a few hours to see the sights. We arrived late Saturday morning and weren’t due in the studio until first thing Sunday, so there was my perfect window. It was umbrella weather but after taking in Woolloomooloo Wharf, the Botanical Gardens, the Opera House and Sydney Harbour Bridge, the sun burned through the clouds and it soon became cocktail weather! The Vivid Light Festival was on so that night I dragged Mr. Rob Knight out to see the city lit up in all its glory. 9pm meant bedtime before an early start on Sunday. At 6am Rob introduced me to Pie Face, a 24hr kiosk where you could get a decent cup of coffee and something freshly baked to start the day. We drove to the studios in Warringah where we met Michael (our local Australian props guy) and set to work getting everything ready for the first live presentations at 8:30am. As I was not scheduled for my first airing until Monday. I spent that first day shadowing and supporting Rob. The world of shopping TV can feel like a time warp. Setting up and also clearing and packing props either side of the live presentations always takes hours, so even with just 3 airings scheduled for the day our feet never touched the ground. Mealtimes are often tricky so that day we took lunch at 10:53am. As we headed towards the nearest eatery (Subway), we noticed a Sunday market. We ended up having Gozleme for lunch instead (a delicious Turkish flatbread and another first for me) and stealing half an hour in the sunshine with the rest of the world. Lovely! The rest of the day remained focussed on the airings with a pause in the evening for that earlier abandoned Subway sandwich! There was also an acknowledgement of the ginormous, chaotic pile of storage boxes which at some point we would have to seriously sort out before we left on Tuesday. We got back to the hotel late that night and it was lights out at 11:30pm before another 5am alarm clock. Due to a mixture of jet lag, mistimed hunger and anticipation for my first live airing in Australia, I totaled two and a half hours sleep that night. But the human body is an amazing thing and the remaining two days were filled with bursts of adrenaline in front of the camera, bizarre mealtimes, a burst water main, trips to numerous retail outlets in search of the “right” storage boxes and the blood and sweat which was shed (literally!) in getting them packed. Hello. You may have noticed that currently it’s not possible to purchase our products from our website. 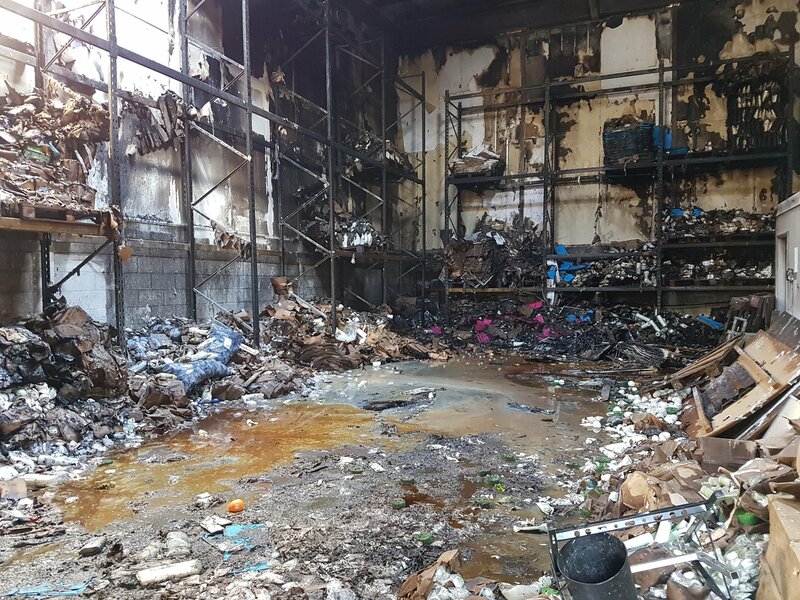 Unfortunately, we suffered a serious fire at our warehouse on the 14th June. As a result we have lost most of our stock, as well as our warehouses and offices. You can see the aftermath of the fire in the image below. However, we are working hard to replenish our stock as quickly as possible and will update you when you are able to purchase our products again. We appreciate your patience and would like to thank everyone for all the support we have received so far. Our customers, suppliers and partners have all been amazing and we are very grateful to them. Our incredible team are busy rebuilding things and we’re confident that we’ll be back up and running in no time! 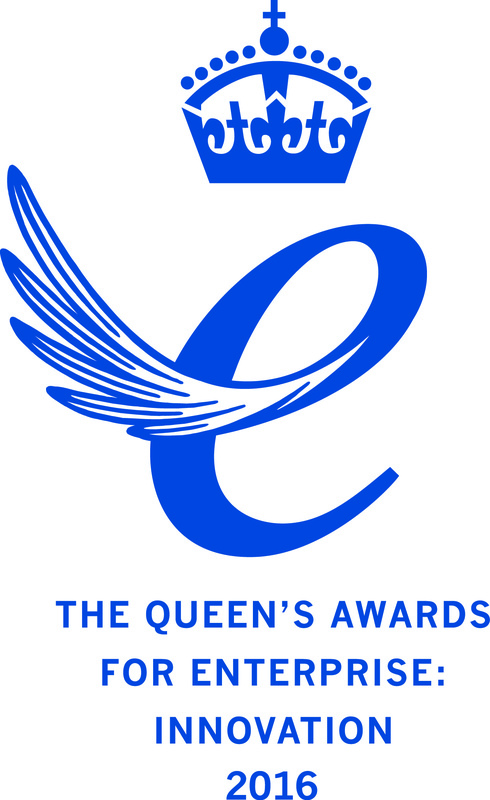 We are delighted to announce that Ecoegg has won a prestigious Queen’s Award for Enterprise. The UK’s highest business accolade, the award recognises our outstanding business success through innovation. To have been awarded a Queen’s Award in the competitive Innovation category is a real achievement. We’ve worked hard as a company to develop products that make a real, positive impact to the lives of people that use them, as well as to the environment. Christmas is over and the New Year has begun. I don’t know about you, but I am still finding glitter scattered over the house and missed puddles of cranberry sauce lingering in the fridge! If, like me you are still dealing with the inevitable mess that Christmas brings, have a read of some great tips to get your home back into tip top shape this New Year! Super sticky when dry and slippery when wet our Lint Rollers are great for picking up all kinds of debris from around the home. Simply roll your Lint Roller over the debris you are trying to pick up, rinse under the tap, dry and re-use. These will be the last Lint Rollers you will ever need to buy! Scrub away any mess which has found itself stuck to your fridge, pans, hob, kitchen surfaces etc. with ease. Guaranteed not to scratch – feel confident to scrub as hard as you like! Our Eggsterminator is so powerful – he can tackle most jobs using just water alone. Made from a unique ‘flex-tech’ material he changes texture dependent on the temperature of the water. In cold water he is firm and rough for tougher jobs, but in warm water he is soft, spongy and super absorbent so he can squeeze into hard to reach areas. When you are done – simply pop him in the dishwasher to sanitise! Have a browse through our 2016 catalogue to get more inspiration on how you can keep your home in tip top shape this New Year!